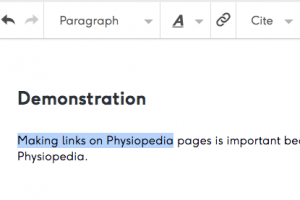 Making links on Physiopedia pages is important because it allows our readers to find other relevant pages on the Physiopedia website as well as related resources outside Physiopedia. To make links on a page follow the steps below. 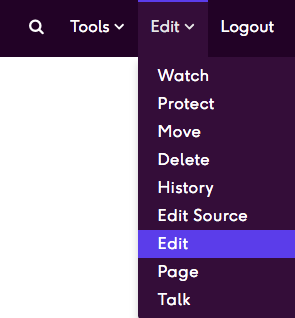 Click on the Edit tab to edit your page (remember, you need to be logged in to access the Edit link). Using your mouse highlight the words that you intend to turn into the link. Then click on the Link button in the Editing Toolbar (it looks like a chain link). A pop-up box will appear. 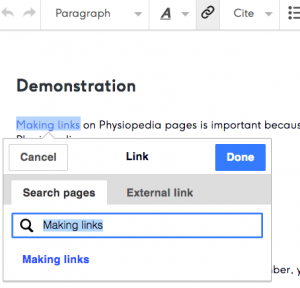 Type the name of the internal Physiopedia page that you are linking to under Search Pages (a list of pages to choose from will appear) OR the full url for the external web page under External Link. Click the blue Done button to save and your new link will appear on the page that you are editing. Click the blue Save button at the top of the page to make sure that your changes are saved. For more information read the mediawiki help page on links.